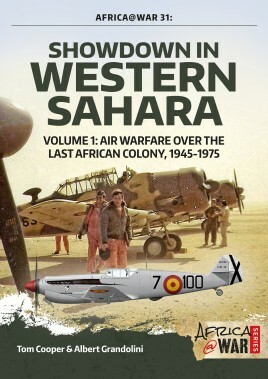 Illustrated by over 100 photographs, dozens of maps and colour profiles, Showdown in Western Sahara offers a fascinating study of the military aspects of this conflict, its strategy, tactics and experiences with different weapons systems. The former colony of Spanish Sahara saw frequent outbursts of tribal and ethnic rebellions already while ruled by colonial authorities, in the late 19th and through early 20th Century. Its vastness and distances de-facto dictated the application of air power in response. While most of these attracted next to no attention in English-language media, at least the large-scale operations of the Spanish colonial authorities of the late 1950s became notable for the final combat deployment of the famous Messerschmitt Bf.109. Narby, their common history as former French colonies resulted in a short war between Algeria and Morocco, which in turn prompted an arms race that lasted well into the 1980s. Following much more action than was ever reported in the media, and amid growing resistance from natives and increasing international pressure, Spain withdrew from Spanish Sahara in 1975, indirectly opening a new chapter of this part of the world, which is going to be covered in Volume 2. Warfare in Western Sahara has in many ways become exemplary for modern-day counter-insurgency efforts in Africa and elsewhere. This is so in regards of this conflict being mis-declared as a part of some larger, external conflict – like the Cold War – in regards of the concept of an insurgency applying motorized forces to deliver often spectacular ‘hit-and-run’ attacks; and in regards of a conventional military reacting with a combination of earth berms and air power. Illustrated by over 100 photographs, dozen of maps and 15 color profiles, Showdown in Western Sahara, Volume 1 offers a fascinating study of the military aspects of this conflict, warfare strategies, tactics and experiences with different weapons systems. Tom Cooper is an Austrian aerial warfare analyst and historian. Following a career in worldwide the transportation business – during which he established a network of contacts in the Middle East and Africa – he moved into narrow-focus analysis and writing on small, little-known air forces and conflicts, about which he has collected extensive archives. That resulted in a specialisation in such Middle Eastern air forces as of those of Egypt, Iran, Iraq, and Syria, plus various African and Asian air forces. As well as authoring and co-authoring more than 30 books - including an in-depth analysis of major Arab air forces at wars with Israel in the period 1955-1973 - and over 1,000 articles, Cooper is a regular correspondent for multiple defence-related publications. Military historian and aviation-journalist Albert Grandolini was born in Vietnam and gained an MA in history from Paris 1 Sorbonne University. His primary research focus is on contemporary conflicts in general and particularly on the military history in Asia and Africa. Having spent his childhood in South Vietnam, the Vietnam War has always been one of his main fields of research. He authored the book Fall of the Flying Dragon: South Vietnamese Air Force (1973-1975) two volumes on Vietnam’s Easter Offensive of 1972 for Helion’s Asia@War Series, and three volumes on Libyan Air Wars for Africa@War Series, and has written numerous articles for various British, French, and German magazines.